This customer had been cleaning her own carpets for years using a rented Rug Doctor machine and solutions. 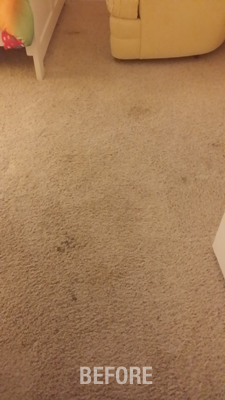 She recently hurt her back and decided she could no longer clean her own carpets. Even though she had cleaned them a year ago she felt they had really taken a turn for the worse in the last few months. Her goal was to maintain the carpets for just another year until they could be replaced. Fortunately, Chem-Dry of Tampa FL was the first professional carpet cleaner she called. Even though she told us she had high hopes she was also a realist and didn’t expect us to remove the spots from her carpet. 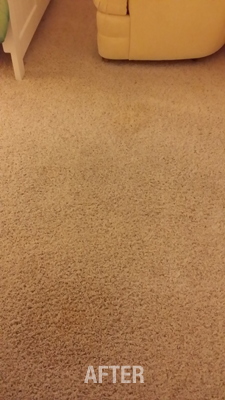 We told her we are carpet spot removal specialist and we had high confidence we would get her carpet completely clean. After two hours of cleaning her carpets went from a brownish grey beige with several spots to a golden beige that had recovered much of its original luster. We told her these were the type of results we expected every time we clean a carpet. She was thrilled and was re-thinking her plan to replace the carpets and just have us clean them on a regular basis. Ultimately this would save her thousands of dollars that she could use elsewhere. So if you have been cleaning your carpets for years but they don’t seem to have that original shine and color they once had, call the spot removal specialist, Chem-Dry of Tampa FL at (813) 402-8403.